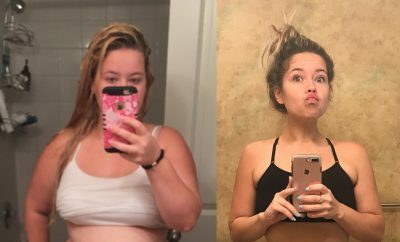 Throughout most of my life my weight has fluctuated and as an adult sometimes by up to 50 pounds—I’d lose it and then gain it back. 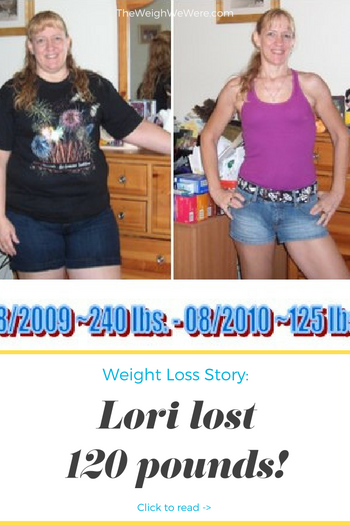 I was a stress eater and had bad eating habits—junk food & snacks along with fast food meals. What exacerbated the problem was the loss of my dad & relocating to live with my mom who cooked pasta for my brother for almost every meal. It was convenient to eat with them, but between that, the fast food and the junk food, it wasn’t long before I gained even more weight. It was uncomfortable sitting and being overweight added to my low self-esteem. My clothes didn’t fit properly anymore and I didn’t want to buy larger sizes. I was generally unhappy with my appearance and didn’t even recognize the person in the mirror anymore. I stepped on the scale one day and saw that my weight had reached an all-time high of almost 240 pounds. 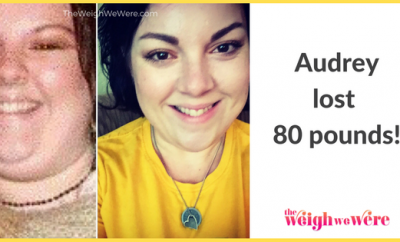 I realized my weight had spiraled out of control worse than ever before and I knew I had to take charge and make some immediate changes to get it under control. I had previously lost 50 pounds using LA Weight Loss and had kept the booklets so I got them out, created an electronic version of their paper meal diary using Microsoft Excel and began planning my journey that was going to begin immediately. I chose my ultimate goal weight and the date I hoped to achieve it by, but also made several smaller goals with projected achievement dates so that the ultimate goal didn’t seem so unattainable. I used the spreadsheet and my LA Weight Loss guides to plan my meals out a week or two in advance and then I only bought and ate the foods I had in my meal plan. I gave up fast food, junk food & snacks. I weighed and measured my food and kept track of everything I ate. 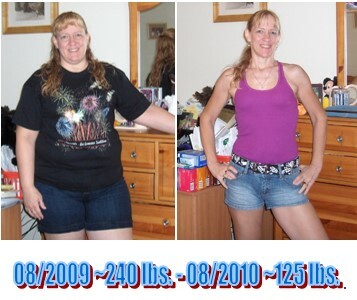 My journey began on July 29, 2009 and by mid-October I was under 200 pounds and by mid-November I had lost 50 pounds so people were beginning to take notice and my clothes were getting looser. The hardest part for me was avoiding invitations to eat out at restaurants and overlooking the ridicule of others regarding my new eating habits as well as their lack of support. No, I never once even considered giving up; I was extremely determined to succeed. Being able to see results kept me motivated to keep going as I became more anxious to see the final results. I celebrated every little threshold I’d reach–190s, 180s etc. and each small goal that I’d set and then I focused on the next one and even added another one after I’d reached my original ultimate goal. I did have some plateau periods, but I researched how to overcome them by using calorie-cycling which is changing the amount of calories consumed each day by increasing it one day and decreasing it the next. I would also revise my meal plans trying different foods. That’s where having the food diaries and my daily weight came in handy because I was able to analyze them and look for loss or gain trends and see what effect various foods were having on my body. If I thought a certain food was hindering my progress I’d replace it with something else to see the effects. I reached the third of my four goals losing most of my weight in 40 weeks and then right around the one year mark–another 16 weeks–I achieved my fourth and final goal of 125 pounds. 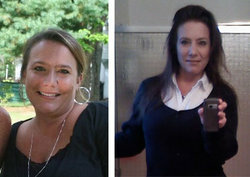 Shortly thereafter, I lost another 5 pounds for a total of 120 pounds lost or half of my original weight. 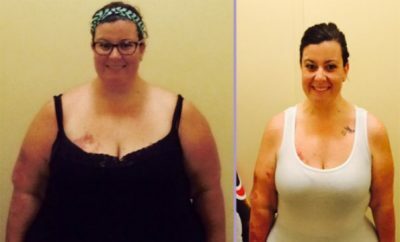 My non-scale victories were when people noticed all the weight I’d lost in the spring when the jackets were no longer necessary because they’d hid my progress up to that point and some people were shocked. I’d also have to saying buying all new clothes and shoes which I felt good wearing was the ultimate non-scale victory which made it all worth it! I went from a size 18 jeans to a size 1 or 2 depending on the style and I’ve been able to successfully maintain my weight between 125-133 lbs. for almost five years. I rarely eat pasta or potatoes because I found that I gain weight very easily if I consume too much of those types of starchy foods. I do sometimes eat snack foods, but I try to limit them to small quantities on weekends. I continue to plan my meals ahead and weigh or measure my foods to ensure that I’m eating the proper portion sizes and I don’t get second helpings. I don’t eat out much because restaurant food is high in calories and sodium. Three months into my journey I began working out at home, just doing exercises I found on fitness web sites. Early the next year my daughter took me to the gym with her and I began going regularly. I found exercise to be a great stress reliever and I like how good I feel after a good workout. I currently workout almost everyday–I go to the gym 2-3 times a week and I do Focus T25 and now the new Insanity Max 30 at home. Beachbody and Shaun T have developed some great workouts that work for all ages. Keep a food diary – I avoided this during previous journeys because it seemed like a waste of time however, on this last journey I decided to try it and I found it to be very helpful. It’s a handy tool that you can use to analyze weight fluctuations and determine the foods that could’ve caused it. For me, knowledge is power and the more I’m able to understand about how my body reacts to certain foods or exercise the better equipped I am to make any necessary changes. Read food labels for portion sizes and calories in each as well as the sodium content. Avoid processed foods and canned foods because some contain a lot of sodium. Fat-free founds aren’t always better because the “fats” are replaced with sodium in some foods such as cheese so low-fat is better. Proper portion size is important because if you eat too much or too little it could impact your progress. Incorporate some form of exercise into your daily routine. There are workouts that are very short, but effective and can be done at home when your schedule permits. Do it for yourself & no one else. Don’t let anyone get you down for trying to make positive changes for yourself. Don’t make excuses about why you can’t or keep putting it off for a certain date–the time is now and excuses don’t burn calories. Instead think of ways around any obstacles you think you might have. It’s all about how bad you want the results and if you want them badly enough you’ll pull out all the stops and go for it without letting anything or anyone stand in your way. Obstacles are those things that appear in your path, but the challenge is to find ways around them. Don’t set your expectations too high or expect drastic results overnight. The weight wasn’t gained overnight & it won’t be lost overnight–it takes time, hard work and total dedication. Don’t give up when you reach a plateau, they’re going to happen; as long as you’re not regressing you’ll get there. Celebrate each and every milestone and just be patient and keep working at it! Last, but not least, understand that losing the weight is only half the battle. The next step is maintaining that loss. Many people think that once you reach your goal you can resume your old eating habits and that’s not true unless you want to gain all your weight back. Permanent weight loss isn’t a temporary diet, it’s a permanent lifestyle change so you have to be diligent about sticking with your new eating habits even after you reach your goal weight. I worked hard to get where I am; I finally like what I see in the mirror and I refuse to allow myself to end up back where I was ever again. I’ve maintained my weight loss for almost five years and for that I’m very proud. If I can do it…so can you!! !